I spend a lot of time in the grocery store. A lot. I'm not very good at planning menus ahead of time much more than three days in advance, because by the time day four rolls around, I've developed a new passion for a new cookbook or I've read a great recipe online, and all that kale or Italian sausage just looks drab and unexciting. I think I've permanently got a couple of wilting leeks establishing slimy residency in the produce drawer and cheese is always in a state of transformation to bleu. 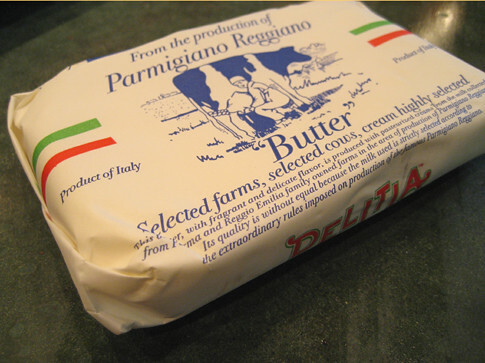 One of my best grocery finds (at Fresh Market) recently was Delitia butter from the Parma and Reggio Emilia areas of Italy. It's a true European butter, cultured, and impossibly sweet. There's full gram extra of butter fat in there, and tempting as it may be to try and bake with this butter, its delicate flavor politely insists that you spread it on bread or melt it atop vegetables, instead of sinking it in a muck of flour and sugar. Plus, it's expensive--some would say ruinously so--but since I lost my receipt I can't confirm that this is so. Your comment about the quality of European butter is one of several that I have read recently and I am wondering how it differs from your usual butter? To us our is just usual and natural especially compared to the rubbishy low fat spreads that are proliferating here in UK at the moment. This butter is FAN-TAS-TIC!!! I was going to email you about it but you have found it. I read about it online in another blog from a person in the UK and I was just walking in ET and there it was. Now if I could just find butter made from French Normandy cream. Can't wait for Whole Foods to open up. Toni-Anne: European "style' butter in the US generally has more fat content, and that gives it a more luscious mouth feel (and even more calories!). It also has a bigger, rounder flavor than regular butter--although this butter is very delicate and has a very clear taste of cream that I find irresistible. The packaging alone makes me want to buy some. It has adorable brass rivets holding the extra thick wax paper together!